I don't know what to do about this review now. I read most of One Day in a state of love and admiration and the feeling that finally, at last, there is a book that understands my generation. I always looked for such a book but could never find one where the atmosphere was spot on. I found what I was looking for in One Day, not because of the story itself but because of the way the characters thought and acted and felt. I could see myself in this story like I've never been able to see myself in any other piece of writing. First of all, they were lost for a really long time and I think that's one of the things that there is so much of. Because we don't have the obligations - legal or societal - to settle down at 20 we are allowed this period of discovering ourselves, of wandering, of not knowing where we're heading. It's easy to wake up around 30 years old and realize that this isn't where you want to be at all. Then there's the way they're always just playing at stuff. Dexter is obviously always playing, at being cool and famous and young. But Emma is too, never quite belonging, never quite believing that she's up to the task. Oh, how many times I've felt this way! All those board meetings with a bunch of men in suits and now all these other meetings with public servants, so more men in suits. And women too actually, and all of them, irrespective of gender, seem to take themselves way too seriously. All those years ago, when I was young and ambitious, I would be asked to do things like meet with the company president and I'd think, 'but it's only me, why would you want to listen to me'. But I looked like I should know. I guess the book made me think about how my outlook changed over the years. When I was younger; I would dress the corporate part but didn't believe that I belonged in that world, that I knew anything. I felt like I was faking it. Now, I dress and I act like me - no more suits, no more corporate behaviour - I'm the same person at work and at home and so much happier. Not everyone likes this, but I feel that I'm true to myself wherever I am and that's important to me. So in the end, it's not one of my favorite books but I certainly loved reading it. Oh, and I think it'll make a great movie, can't wait to see it! What did you think? 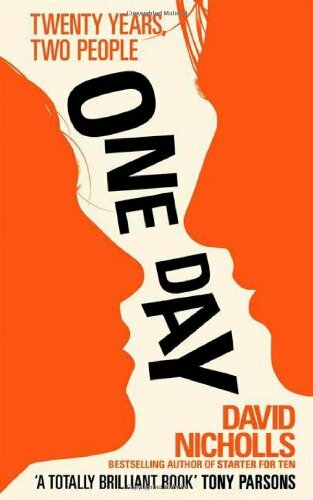 If you haven't read One Day yet, did the ending ever totally ruin a book for you? I have to admit that I haven't really been interested in this book, but your review comes to the book in a different way and it actually makes it sound more interesting than I thought. That being said, it is too bad the ending doesn't seem to be working for anyone! My reaction was the opposite of yours. I didn't fully connect with the book until the ending. For me, the ending is what got me fully invested in Emma and Dex's story. Joanna, great review :) I felt very much like you did about One Day: if you can' relate to events or people, you won't enjoy it half as much. The end was a cop-out pure and simple. Nicholls found the easy way out. I've been wary of reading this book, considering all the hype surrounding it. It does sound very very good though, and I probably should read it. I hadn't heard anything about this book until recently and there is SO much praise! I thought the movie looked boring and rather depressing so I've been avoiding it, but I think I'm going to have to check it out now. Hmmmm--and definitely curiuos about the ending!